Controlling the CameraTo help kick off AT&T's new "Your World Delivered" ad campaign, PlayMotion was hired to design a series of interactive spots to run on the Reuters sign in Times Square. 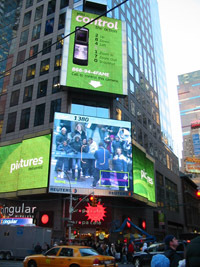 Using their cellphones as remote controls, one person at a time was given complete control over a robotic camera which they could use to pan and zoom and see themselves on the massive 30' x 40' LED screen in the heart of Times Square. Your Picture. Delivered. Once they were in view, participants could take a snapshot with a simple button push, which automatically sent the photo to a private web address. As the shutter snapped on the big screen, simultaneously a text message was sent to the participants phone, telling them the secret web address where they could pick up their once in a lifetime souvenir. 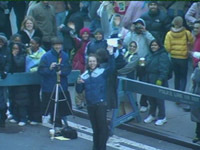 The camera was accessible for 10 minutes per hour over New Years Eve and continued to run 20 minutes an hour every day for two weeks in January. It received over 1000 calls and took over 2000 pictures. The operation of the camera application was split up into many parts. It starts with a "voice site" that people call and prompts them to press buttons. This is done via a configurable 3rd-party web service that can interact with our application by sending web requests to a server and receiving responses. Another programmer and I jointly configured the voice site, with me primarily focusing on its interaction with our application. I also created web scripts that the voice site interacted with in order to hold callers in a waiting queue while someone else is in control. My main responsibility was the server application that listened for and responded to messages from the voice site. It also controlled the motion of the camera. I had to design several different methods of controlling the camera with a phone and iteratively refine them through user-testing, with final selection by the client. I had to consider factors such as whether the camera motion was continuous with a stop button or in discrete steps. Which is more appropriate for pan versus tilt? What should the speed or step size be? How should that vary depending on the zoom? The goal was for someone on the street to be able to find themselves in under 60 seconds. When the time is up, my camera control program was responsible for uploading the photos and sending the caller a text message with the URL.